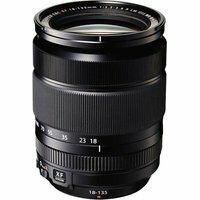 The Fujifilm 18-135mm f/3.5-5.6 WR LM R OIS Fujinon Lens with Fujifilm X-mount is a flexible zoom that covers a vast shooting range from wide-angle to telephoto (27-206mm 35mm equivalent). The lens is designed to meet the demands of 'everyday' photography and is suitable for capturing a variety of subjects, including landscape, architecture, portraiture, wildlife and sports. Its compact, weather resistant structure combined with its advanced 5.0-stop image stabilisation system makes it the perfect all-round lens for travel and outdoor photographers. The XF18-135mm R LM OIS WR lens utilises an inner focus mechanism for rapid autofocusing speeds. When combining this lens with an X-series camera body which is compatible with phase detection AF (X-E2 and X-T1), smooth photography is offered with faster AF.